A so-called “safety driver” sits behind the wheel of an autonomous car during testing and is supposed to be ready to take over should an unusually difficult situation occur while on the road. Waymo has had to admit this week that one of its safety drivers recently caused an accident within seconds of taking the vehicle out of autonomous mode. The incident occurred near the headquarters of its parent company, Alphabet, in Mountain View, California, and put a motorcyclist in hospital, though the extent of his or her injuries isn’t clear. So, what happened? According to Waymo CEO John Krafcik, the safety driver took control of the car at a speed of about 21 mph after seeing a passenger car to the left make a sudden move toward the lane in which the Waymo car was traveling. Waymo’s driver reacted to the situation by quickly moving the vehicle into the right lane, but as they did so, they failed to notice a motorcyclist — traveling at about 28 mph — who had just moved from behind the Waymo vehicle into the right lane in order to pass it. “As a result, our vehicle’s rear right bumper came into contact with the motorcycle,” Krafcik wrote in a post describing what happened. An official accident report submitted by Waymo noted that the motorcyclist sustained injuries and was taken to hospital for treatment, while the Waymo car sustained “minor damage” to the rear bumper. Interestingly, Waymo’s CEO claimed that had the driver left the car in autonomous mode, its technology “would have avoided the collision by taking a safer course of action.” Considering how the self-driving car is laden with sensors to give it 360-degree awareness, this certainly makes sense. Krafcik elaborated: “While our test driver’s focus was on the car ahead, our self-driving system was simultaneously tracking the position, direction, and speed of every object around it. Crucially, our technology correctly anticipated and predicted the future behavior of both the merging vehicle and the motorcyclist. Our simulation shows the self-driving system would have responded to the passenger car by reducing our vehicle’s speed, and nudging slightly in our own lane, avoiding a collision.” With that in mind, it sounds like Waymo would do well to get its fully driverless cars (ie. without a safety driver) onto the streets of Mountain View sooner rather than later. 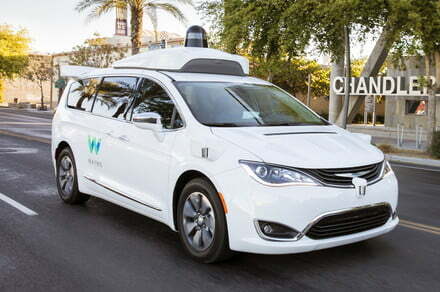 Many observers will see Waymo’s human-caused accident as the perfect argument for expediting the development of autonomous vehicles, but with driverless-car technology being tested on public roads by more than 50 companies in California alone, it’s inevitable that occasional accidents — whether the result of safety drivers, regular drivers, or faults with the technology — are going to occur for a while yet. But, of course, even one accident is one too many, certainly if it results in an injury, or worse. The industry was rocked earlier this year when a self-driving car being tested by Uber knocked down and killed a pedestrian in Arizona. The technology failed to spot the pedestrian in the dark, but the safety driver didn’t notice the error and so had no chance to intervene.